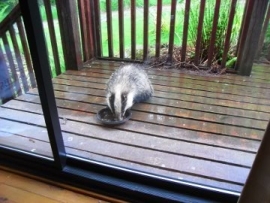 Criffel Lodge is an ideal holiday chalet for wildlife and birdwatching holidays with abundant wildlife to be seen from the lodge - including badgers and red squirrels. RSPB Mersehead is just afew miles away. For activity holidays there is 7Stanes Mountain Biking at Dalbeattie and Criffel Lodge is next to Colvend golf course. It's a short walk to Sandyhills beach and the coastal path leading round to Rockcliffe. Sleeps 6 comfortably in three bedrooms. Discounts for smaller groups. Double glazing and central heating, travel cot available at no extra cost. The chalet style lodge is situated on the edge of Colvend golf course and next to mature oak woodland. Criffel Lodge is one of a small group of ten log cabins with pleasant country views. There is even a limited view of the sea and the Lake District from Criffel Lodge. 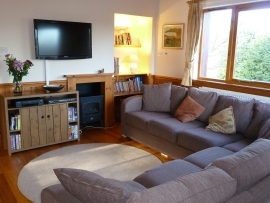 Criffel Lodge sleeps 6 in three bedrooms, one double and two full sizes twin rooms. There is a spacious open plan living, dining, kitchen area and a decking balcony. The lodge has full central heating. Bed linen is provided, but please provide you own towels. WiFi is provided and is as fast as we can get it, please note this may not be as fast as your home connection . In this area of rural Dumfries and Galloway mobile phone signals are variable and can be poor or no signal. Criffel Lodge really is the place for a self catering holiday. Whether you want to relax in peaceful surroundings or tire yourselves out with every activity you can think of, you'll enjoy your stay. Get in touch now directly with the owners and make your booking.